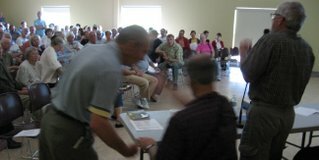 The Annual General Meeting of Renaissance Lac Brome was held recently at the Lac Brome community center and the Saturday morning was sunny and warm as the crowds gathered, filing in from the parking lot around the newly constructed meeting facility in what felt like a Sunday Mass gathering at the local church. There was a bottle neck at the entrance as the crowds filed into the meeting room with the lovely large windows overlooking the Lions Park and the high sloping ceilings adding to the cathedral like atmosphere, all that was missing was the sounds of an organ playing and a few candles! Renaissance Lac Brome is a grass roots organization that has been around for several years with a fairly large membership of citizens concerned with the state of Brome Lake especially during the many recent years when blue green algae have caused shut-downs of not only Brome Lake but also many other lakes in the area of the Eastern Townships. In the lobby tables were adorned with pamphlets and information on the Renaissance Lac Brome vision as well as a table featuring phosphate free soaps and products that households can use to help reduce the phosphates that flow into the lake. Phosphates have been pinpointed as the main nutrient in the lake that causes the deadly blue green algae. As the meeting came to order heads turned and surveyed the hall trying to find the location of the members of the town council, namely the Mayor of Lac Brome, who had apparently been invited to attend the meeting. There were reported sightings of one council member at the start of the meeting but it seems his presence at the meeting was short lived. On one level it was understandable that no-one from the Town of Brome Lake council showed up as this was an annual meeting of a private, home-grown collection of concerned citizens who want to take the care and protection and stewardship of the lake into their own hands; on the other hand some folks found it odd that the Mayor, whom the day before at a press conference was doing his best to highlight how the Town of Brome Lake was getting serious about taking care of the lake, didn’t nod a sign of encouragement towards the efforts of Renaissance Lac Brome (RLB) by attending their meeting. Of course it’s not really hard to understand the Town’s reluctance to send in one of their own considering the way these two groups have been getting along it would be like sending in an un-armed soldier into enemy territory! Heck, if the Mayor had attended the meeting it likely would have turned into something akin to Saving Private Ryan! As it was, the meeting was quite interesting and under-scored how a band of citizens and residents can actually try and work together for a common goal which is no mean feat in these days of personal self-interest. The guest speaker was Robert Lapalme, renowned author and aquatic specialist who has been active in restoring lakes for over 20 years, who presented his ideas on how to best combat the problems of pollution and blue green algae in Brome Lake. His approach would be a long term approach that would see positive effects in the 10 year range. Dealing with such complex natural systems is not something that can be tackled in a few short years. The key, of course, will be to reduce phosphates which are known to be partly responsible for the toxic algae blooms among other problems. Restore the shoreline and reduce the amount of lawns and reduce drastically or eliminate the use of fertilizers on lawns and in gardens. He spoke of how we saw that any change would require a complete mind shift from our current obsession with manicured lawns. Anyone who has driven around the lake can imagine that asking the residents to eliminate their lawns may create a bit of resistance to say the least! Considering the golf courses and new development going on within the Lac Brome watershed it seemed like any hope to save the lake would be doomed to fail if the current way of thinking continues. It sounds a bit like saying we need to do something about global warming but who among us is willing to give up our vehicles? Even with Mr. Lapalme’s somewhat utopian view of the solution he also underlined that major changes needed to be made in the infrastructure of all municipalities. He spoke on the drainage systems and roadside ditches that were often constructed completely wrong by Town workers and construction crews. 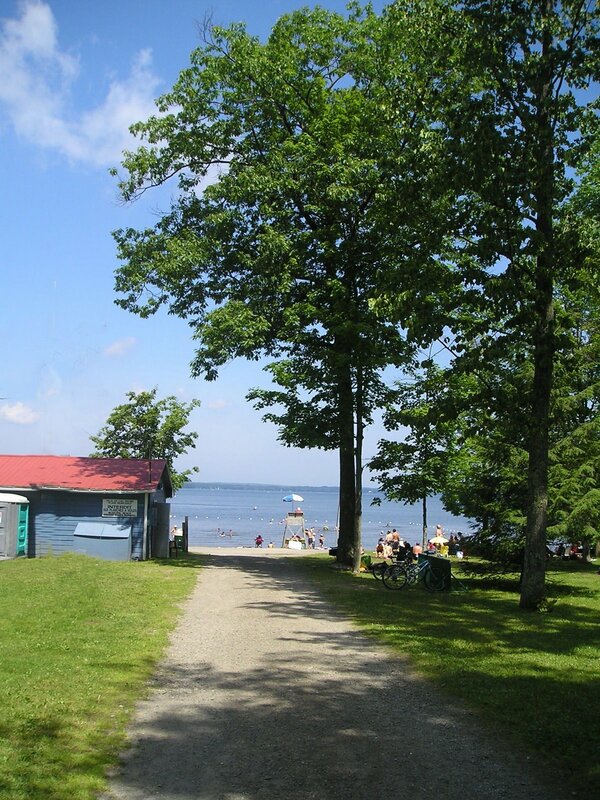 The drainage systems must be improved upon so that fertilizers and other chemicals are not simply washed into the lake; bands of thick plants to act as filters are desired to soak up phosphates before they enter the lake. Many home-owners along Lakeside or Bondville have lawns that look like they are expecting Tiger Woods to putt out at any moment and the fact that our own ex-Prime Minister Paul Martin wants to build a private golf-course on his land is proof that no matter how much we are learning about our environment there are always going to be a certain group of people who are not willing to do a paradigm shift in thinking to perhaps contemplate the idea that what we need is wild, lush vegetation and not treeless expanses of manicured, fertilized fairways! Regardless of the intentions of RLB it will take more than a few hundred determined minds to try and change the existing rules of the game. I do admire their ambitions though! Many people think that the reality is that the people who run the game, like the Ministry of the Environment, The Government of Quebec and the Town Councils of the region are controlled by the very people who own businesses and farms that drive the economy or develop land for real estate. Trying to change their minds would be like asking them to suddenly start using a barter economy. RLB, since it’s inception years ago, has seen many people involved in their leadership throw up their hands in surrender and frustration the new group headed by Peter White seem determined and non-plussed by the hurdles in front of them! They have now 30 representatives around the lake who will constantly monitor the condition of the lake and watch for any signs of algae blooms and outlined their concrete steps which they believe need to be taken to restore the lake including: making the lake a priority, ensure that farms and golf courses cut back on fertilizer use, restore the shoreline, improving ditching practices. The meeting question period had to be cut short due to time restrictions, for some reason the hall had only been booked until noon and then another group had the space reserved, so the question period didn’t get to play out for more than 5 minutes. The thrust of the sentiment expressed by the members and onlookers in the hall was that it was incredulous that no-one from the Town of Brome Lake attended the meeting.